As March Madness nears, North Carolina is in the running for a No. 1 seed in the NCAA tournament after beating Duke. 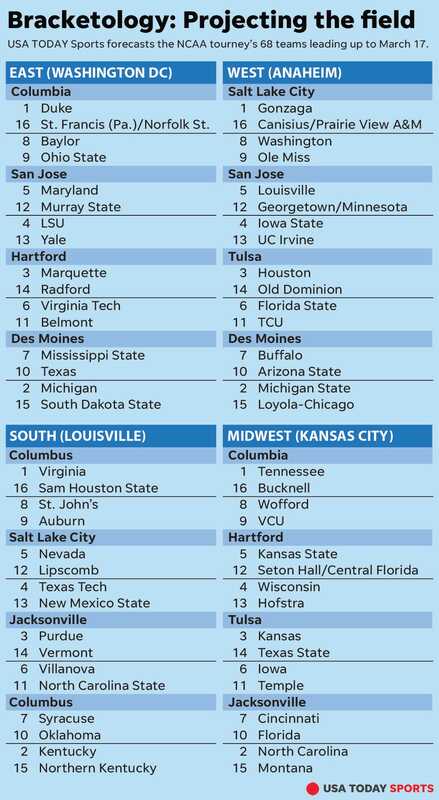 Bracketology examines the case. Editor's note: This story has been updated with the latest NCAA tournament projections through games on Feb. 21. Lost in the chaos that was Zion Williamson's bizarre shoe-malfunction knee injury Wednesday was the fact that North Carolina is a good college basketball team playing its best at the right time. The Tar Heels (21-5, 11-2) might've hammered a Zion-less Duke team by 16 points but the way in which they did it — scoring 62 points in the paint behind Luke Maye's 30-point, 15-rebound performance — was quite telling. They shot just 10% (2-for-22 from beyond the arc) against the Blue Devils and still cruised. Even if Williamson was checking Maye and injecting his shaken Duke teammates with energy, it still might not have been enough, especially had the 'Heels been at least average on the perimeter. Prior to its résumé-boosting road victory at Duke, the Tar Heels had their most lopsided road win in school history against Wake Forest when they won by 38 points. That brings us to North Carolina's current status. The Tar Heels are the second-best No. 2 seed in the latest bracketology behind Kentucky. However, home matchups against Florida State and Duke plus a road trip to Clemson are opportunities to bolster their profile with Quadrant 1 (top-30 home/top-75 road) victories. If UNC keeps riding its momentum — having won nine of its last 10 — there's opportunity to overtake Gonzaga or Tennessee at the No. 1 line. It'd take a collapse from Duke to surrender its No. 1 seed, and the selection committee will likely provide leeway if Williamson misses time but returns at full strength. And the other No. 1 seed Virginia was UNC's only loss in the last month and a half. The biggest competition for the Tar Heels might come from Kentucky, which beat North Carolina in December. North Carolina (6) and Kentucky (8) have more Q1 games than Tennessee or Gonzaga (four apiece). Winning out all the way through the ACC tournament — with defeats of Duke and Virginia — would be enough to secure a top NCAA tournament seed, though that is a difficult task. But the point is UNC is right in the mix to make it interesting this March. "We've always had our destiny in front of us," Maye told reporters after the Duke win. • On life support: Oregon State, Texas A&M, Miami (Fla.), UCLA, Connecticut, DePaul, Missouri, Oklahoma State, West Virginia, Fresno State, Notre Dame, Boston College, Georgia, Liberty, Xavier, Saint Louis, San Francisco, Memphis, Southern California, South Carolina, Georgia State, East Tennessee State, Pittsburgh, Dayton, Northwestern, Arizona, Oregon, Providence, Creighton, Davidson, Arkansas. Multi-bid conferences: ACC (8), Big Ten (8), Big 12 (8), SEC (7), Big East (5), American (4), Ohio Valley (2), Pac-12 (2). Leaders or highest RPI from projected one-bid conferences — (24 total): VCU (Atlantic 10), Vermont (America East), Lipscomb (Atlantic Sun), Montana (Big Sky), Radford (Big South) UC Irvine (Big West), Hofstra (CAA), Old Dominion (Conference USA), Northern Kentucky (Horizon), Yale (Ivy), Canisius (MAAC), Buffalo (MAC), Norfolk State (MEAC), Loyola-Chicago (MVC), Nevada (Mountain West), St. Francis-Pa. (Northeast), Bucknell (Patriot), Wofford (Southern), Sam Houston State (Southland), Prairie View A&M (SWAC), South Dakota State (Summit), Texas State (Sun Belt), New Mexico State (WAC), Gonzaga (WCC).